realhousewifeofaiken | You fail only if you stop writing. There are a couple of events in South Carolina this weekend. One is The Battle of Aiken, a weekend long reenactment of one of the last battles of the Civil War. The other event, which could be called the Battle For Aiken, is the Republican primary. In anticipation of the primary, the residents of South Carolina have been barraged with all sorts of political nonsense. I’ve come home from running errands to find several messages from various candidates, PACs and the like. Every other ad on TV is promoting the candidates – some are benign and some are downright nasty. The same goes for the calls. The last one I received, from a PAC, wanted me to know what at liar and cheat Ted Cruz is. It doesn’t take a rocket scientist to figure out who that group supports. All of the contenders were crossing the State, with increasing fervor, so I decided to attend a few events. I probably could have spent most of the day and well into the night going from one to another, but the three I did go to were more than enough. The week began with a Ted Cruz rally, held at the Aiken campus of the University of South Carolina. The last time I’d been at the Convocation Center was to man a booth for the Equine Rescue at a bull riding competition. A fitting touch of irony, don’t you think? I arrived early, around 9:30AM for the 11AM event. There were plenty of seats available at that hour and I found one on the floor, about ten rows from the makeshift stage. I struck up a conversation with a young couple who had moved from Texas to Augusta, Georgia as he was in the military. They had already decided that Cruz was their guy and were more than happy to tell me how they admired Cruz’s principles. To my right was an older woman, who was living in Aiken after retiring here from Ohio. She was not quite as sold as the young couple when it came to Cruz and wasn’t sure who she was voting for on Saturday. Most of the people I chatted with were of the same mindset as I am, though – anybody but Trump. That struck me as odd given all of the poll numbers, but, then again, we were at a Cruz rally. I probably should note that there was a Trump bus parked outside and volunteers were in the lobby, handing out stickers, brochures and buttons to anyone who wanted them. The time had finally come for the rally to start and, after we stood for the Pledge of Allegiance and the national anthem, author and radio host Glenn Beck was introduced. Now, Glenn is an interesting guy. He’s a recovering alcoholic and gives credit to God for the steps he’s made in his successful battle with alcohol. He gave a rambling talk about that and then related a story about George Washington. It involved a talk our first president had with God and how God told him to get back on his horse and continue to fight the good fight. The crowd loved it and a smattering of amens could be heard. Beck then introduced Senator Cruz to cheers, sign waving and a standing ovation. During Beck’s introduction, he spoke about Cruz’s childhood where the future senator grew up with a Bible and a copy of the Constitution were always on the kitchen table. The crowd of supporters seemed to be particularly excited about this. Cruz began by letting us know what he planned to do on his first day in office. He’s going to be really busy and might have to skip a couple of inaugural balls if he wants to make good on it all. He’s going to get rid of Obamacare, undo every illegal and unlawful executive action taken by President Obama, restore religious liberty, have the Department of Justice investigate Planned Parenthood for illegalities, rip the Iran deal to shreds and move the American embassy in Israel from Tel Aviv to Jerusalem. Like I said, it’s going to be a long day. As his appearance came just a couple of days after Justice Scalia’s passing, Senator Cruz had a few things to say about his replacement. Just as we’ve heard from most of the GOP, he intends to block any appointment attempts by President Obama. He told the crowd that another progressive justice will leave us with abortion on demand, the destruction of the 2nd Amendment and the end to our religious freedoms. I kind of liked his idea to abolish the IRS and go with a flat tax. Honestly, who really likes the IRS? I should note that I’ve been to a lot of political events over the course of my life. I’m a political junkie and going to breakfasts, dinners, fund-raisers, rallies and caucuses are my idea of good times. Having said that though, I’ve never seen anything quite like this rally for Ted Cruz. It was part political rally and part revival meeting. There were as many quotes from scripture as there was speechifying about what a Cruz administration would look like. I found myself wondering how it would be received up North and decided it wouldn’t because it wouldn’t happen. Cruz would change the rhetoric and the tone because he would be addressing a very different demographic. In South Carolina, the evangelical vote is crucial but carries very little weight in much bluer States. The next event I attended was a forum with Jeb Bush and Ben Carson. While the other two events only required a registration where you printed out a ticket, those who wanted to see the candidates Tuesday night had to buy tickets. I managed to wrangle VIP seating because I hate to pay to see politicians. The doors were to open at 5:30PM and I arrived right around then. Unlike the day before, we had to walk through metal detectors, which were manned by the TSA and a few Secret Service men in jumpsuits and safety vests. I can’t explain why, although some of us wondered if President Bush was making a surprise appearance as he’d been campaigning for his brother most of the day. Same venue, much different atmosphere. Yes, Trump’s bus and volunteers were there, too. I found myself having a conversation with a lovely couple from New Jersey, and I felt much more comfortable having spoken with them. Even though I’ve lived here for a while now, it’s always nice to come across some fellow Northerners. This evening began with a comedian, who told some not so funny jokes targeting Democrats. It was expected, I guess. We then heard from Senator Lindsey Graham and Congressman Joe Wilson. Yes, that Joe Wilson, the one who displayed some very un-Southern bad manners during a State of the Union address. After they spoke, Governor Bush was introduced and given time for a few words of his own. He’s tall – really tall, and he was sporting his new contact lenses. Apparently, someone on his staff didn’t think his glasses sent the right message. He was wearing a pullover sweater and jeans. From there, Bush was asked a series of questions from Congressman Wilson, State Attorney General Wilson and Republican State Chairman, Matt Moore. They covered a few issues, local and national, including eminent domain. The Governor left the podium and it was time to introduce retired neurosurgeon Ben Carson. Dr. Carson wore a suit, and I was happy to see that his tie was neither red or blue, but a wildly colorful paisley. He was given the same amount of time for his own comments, and was actually a bit funny at times as he ruminated about some of the absurdities of political campaigns. Without mentioning him by name, Carson took a jab at Trump by saying that being loud doesn’t make you right. All of us liked that. The same panel then asked him the same questions they asked Jeb Bush, and I really didn’t see a big difference in their respective responses. Once the questions ended, a very nice thing happened. Dr. Carson introduced his wife of 40 years, Candy. It seems that she makes a brief appearance at each of his events and comes on stage to say one thing. “I’m Candy Carson and I approve this message.” Nice, right? My third and last event, at least for me, was at the Odell Weeks Activity Center in downtown Aiken, and was a Town Hall meeting with Senator Marco Rubio. Kismet must have been on my side, because the very same couple from New Jersey that I’d met the night before were in line in front of me. We entered the gymnasium at the center and found seats on a set of bleachers. Sentaor Rubio’s appearance was held up for a bit because the crowd was larger than expected and upset the Fire Marshall. By the way, all three events were packed. The Junior U.S. Senator from South Carolina, Tim Scott, was chosen to introduce Senator Rubio and he did it very well – with great humor and respect. The crowd had been worked into a small frenzy by people I can only describe as campaign cheerleaders. A woman had yelled “Marco” and the crowd responded with “Rubio” (No,not Polo). Marco Rubio took the stage to cheers and applause from an audience seated around the stage. He spoke, without notes, for well over an hour. He told the story of his immigrant family who knew poverty, but raised their children to do and be more. Whatever your politics may be, his story is the one we like to call the American Dream. He talked about the plight of the veterans, the burden of student loans and the disparity in our tax laws. I found him charming, intelligent and as sincere as a politician can be. He’s also kind of cute. I just thought you should know that. When I left the gym, I sat in my car for a few minutes to let the traffic clear out. I turned on the news and heard that South Carolina Governor Nikki Haley had just endorsed Senator Rubio. I think I also heard Jeb Bush utter an expletive and a long, sad sigh. I never got the opportunity to see Governor Kasich and I didn’t care to see Donald Trump. I think the 9 1/2 hours I spent sitting in folding chairs and bleachers were worth it. I have to vote on Saturday and I’m really hoping that my decision will be the right one. That’s really all any of us can do. Morgan didn’t kill the Wolf. Instead, he has him locked up in one of the houses and tells him the story of what he went through, what he’d become and how he turned his life around. 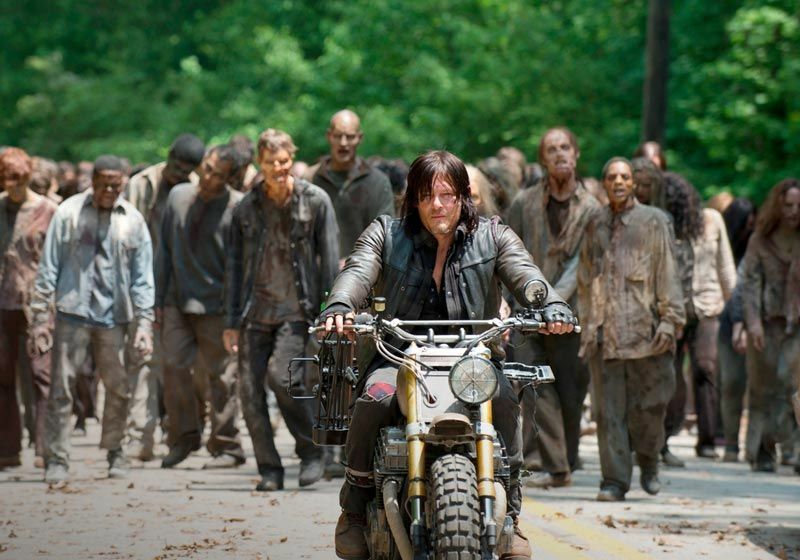 Morgan had made his way, alone, by clearing everything – walkers and people. It didn’t matter. If something or someone got in his way, he shot it, stabbed it or strangled it with his bare hands. One day, as he was clearing, he heard the sound of a goat bleating and found a cabin in the woods. A man called out, telling Morgan that there was no need to do anything stupid, but that they could talk about whatever it was that Morgan wanted. When Morgan didn’t listen, he was knocked out. He woke up in a cell inside the cabin with a plate of food in front of him. The man who had brought him in was Eastman, a former forensic psychologist who had been responsible for reporting to the State as to the mental state of prison inmates. He was the one who could suggest whether they were ready to join society or remain behind bars. Eastman tries to Morgan out but Morgan isn’t interested in talking. he wants to die and wants Eastman to kill him. Eventually, Eastman lets Morgan out of the cage and Morgan fights with his host who overtakes him, thanks to his skills at Aikido. Eastman has to go out for supplies and asks Morgan to keep an eye on the goat, Tabitha – he still hasn’t perfected the art of cheese making – which Morgan does, taking out some walkers and a couple of tomato plants in the process. Eastman gives Morgan a book, “The Art of Peace” and tells him about one prisoner he had studies while he worked for the State. This particular prisoner was guilty of horrible crimes but was also smart and charming, fooling everyone except for Eastman who saw right through his cunning. The man was released, despite Eastman’s efforts to keep him locked up. He then went to Eastman’s house and killed his family, later telling him that he wanted out only so that he could destroy Eastman’s life. Eastman spent his time plotting to kidnap the prisoner while he worked in the prison gardens. He wanted to bring him to the cabin, put him in the cage he’d built and watch him starve to death. He told Morgan that that was when he realized all life was precious. After some time passes, Eastman begins to teach Aikido to Morgan, telling him that it’s all about redirecting movement. During one of their sessions, after Eastman tells Morgan he’ll hold a baby again, walkers approach them from the woods. Morgan freezes, causing Eastman to have to step in and getting him bit, as well. Morgan is angry at Eastman, screaming that it wasn’t his job to do that for him. The two men fight with Eastman knocking Morgan to the ground. Morgan, again, begs Eastman to kill him. As Eastman wheels the walkers away for burial. Morgan takes out another walker that’s after a young couple. She reaches into her knapsack and hands Morgan a can of food, bartering for their lives. When he gets back to the cabin,, Morgan finds a walker munching on Tabitha, much to Eastman’s dismay. Morgan then takes up the grave digging and lets Eastman sit down. He spots a grave marker with the name of the man who killed Eastman’s family. He had, after all, snatched the man from the prison fields and locked him in the cage. He also watched him starve to death, for forty-seven days. It brought him no peace, no sense of relief or closure for the loss of his family. He found peace when he made the decision to never kill again. He wanted to turn himself in, then found out, while he’d been holed up in the cabin, that there was no on left to turn himself in to. Eastman explained the piece of drywall that Morgan had broken earlier. It had a drawing on it that his daughter had made. After his prisoner had died, Eastman walked home and retrieved it to hang in the cabin. He then tells Morgan that he’s ready and lets him know where his gun is. Morgan buries Eastman and sets out onto the train tracks, towards Terminus. 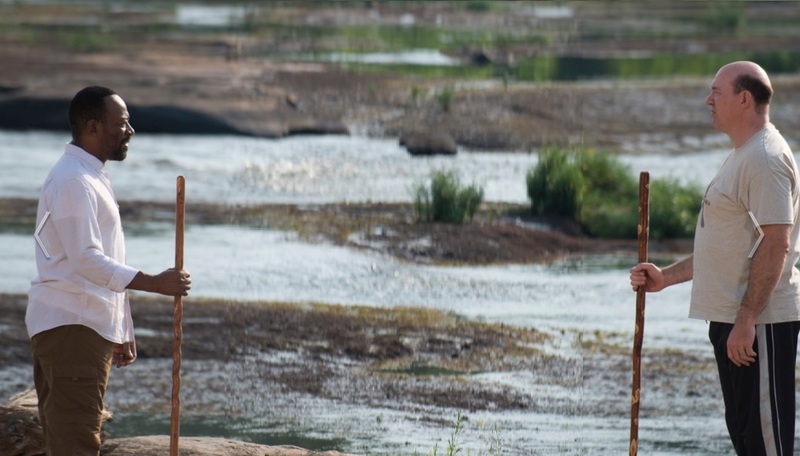 If The Walking Dead is all about keeping one’s humanity or fashioning a new one in the face of unspeakable acts, then this episode was the best demonstration of both sides of the notion. Can you be a pacifist and a survivor or do you have to choose between the two? And what happened to Glenn and Rick? Enid has had a tough journey. Her family was wiped out by the walkers and she was left to find her own way, which she did, hiding from walkers, devouring a passing tortoise and leaving the letters “JSS” scrawled along the way. She did make it to Alexandria, but it’s almost a given that she was never going to fit in with what the community had fashioned for itself. Inside the walls of the gated community, everyone is carrying on with their normal, everyday lives. Carol and a few of the other women are sharing creative recipes with the assortment of supplies they have on hand, including Carol’s amazing cola canned ham. Carol tells one of the women that she isn’t to smoke inside the house anymore. She also stops to tell Pete’s son that he has to get over the death of his abusive father. You either get beyond it or it eats you up. Ron and Jessie exchange a few words about Pete’s death, too. He wants to hold his mother responsible for the fact that his dad isn’t alive. Deanna and Maggie discuss life after loss and plan on planting a garden as a sign that things go on. There’s a new doctor, now that Pete’s gone. Denise is a psychiatrist, because she found out in medical school that treating patients and the thought of performing surgery gave her panic attacks. This near idyllic day goes terribly wrong as Carol, who, after putting a casserole in the oven, is watching her neighbor enjoy a cigarette on the lawn, sees the woman hacked to death. Alexandria is under assault by The Wolves, and everyone is forced to act or be killed. Carol grabs a gun, tells Carl to watch Judith, and goes outside, making her way between houses and trees. Jessie and Sam hide in a closet and Ron is nowhere to be found. Carol sees Alexandrians being hacked to death, and delivers the final cut to one of the women who, only a few moments ago, was trying to figure out the best use for celery soup. Spencer, Deanna’s son, is firing on an 18 wheeler as it barrels towards his guard tower, smashing into it and finally revealing the sound that sent the walkers into a frenzy as that of the truck’s horn. Spencer crawls down, opens the door to the truck and finds a walker inside. When he seems to be unable to react, Morgan appears and dispatches the walker and stops the horn. Morgan also tells him that he might be better off staying outside the walls. 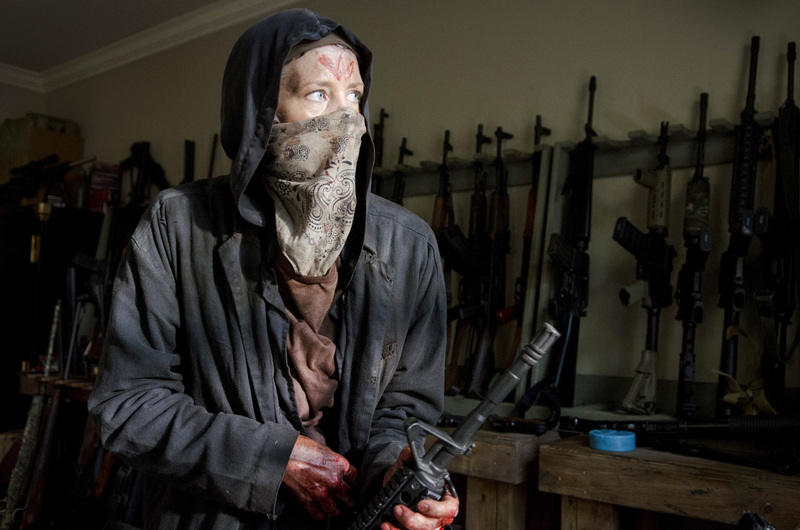 Inside Alexandria, Morgan confronts one of The Wolves and tells him to leave, but Carol shoots the attacker. Carol has managed to disguise herself as one of The Wolves, Aphid, so that she can move about town without drawing suspicion. She also drapes a chain around Morgan to further her disguise until Morgan runs off to help someone who’s injured. Carl is doing his best at keeping Judith and Enid safe, even shooting one of The Wolves. Carol has made it to the armory, where she finds Olivia and gives the woman a two minute lesson in how to point and shoot a gun. A Wolf has entered Jessie’s house and the woman turns into the worst – or best – Mama Bear ever, grabbing her hair scissors and stabbing The Wolf to death. Morgan saves Gabriel from a Wolf and proceeds to tie the attacker up, but Carol comes along, shoots the Wolf and gives Morgan and Gabriel guns. Carol don’t play. Seriously. She’s the honey badger. After she goes back to her one-woman mission of Wolf annihilation, Morgan encounters a group of Wolves. He warns them to leave, telling them that what they’re doing will only mean more of them will die. They’re unarmed and have little defense against the Alexandrians. And Carol. They take his advice and leave the town, and Morgan closes the gate behind them. The battle seems to be winding down. Denise is trying to treat one of the more severely injured, but she’s finding that this type of thing gives new meaning to panic attacks. he’s urged on by Eugene, though, who tells her she doesn’t want to be a coward. Aron comes across the body of a Wolf and finds his own backpack on the body, with a stack of pictures from Alexandria inside. Morgan is confronted by one more Wolf, a familiar one who he’s come upon before. The two men fight and the Wolf seems confident that Morgan won’t kill him. After taking the Wolf to the ground, Morgan says’ “I’m sorry” and drives his stick through the man. Carl tries to find Enid but only sees a note she left. Just survive somehow – JSS. Morgan and Carol are walking the streets, passing each other without acknowledgment, through the smoke. Carl hears the sound of the oven timer and takes Carol’s casserole out. 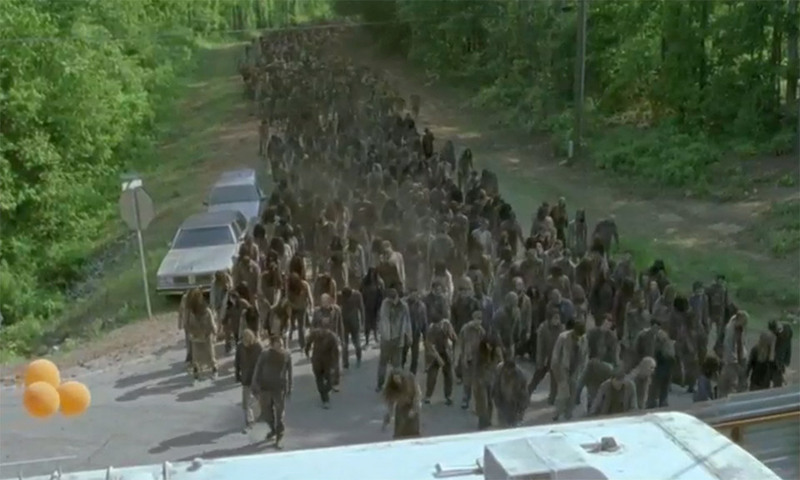 This battle is over, but there are thousands of walkers headed for them. During ones of the scenes, The Wolves said that the people inside Alexandria don’t belong there, as if they were warning them. It wasn’t clear what they meant, if anything, or if they’re just crazy and say crazy stuff. Everyone who watches TWD can’t wait to see what kind of disguises Carol will come up with in the future. She’s got an outfit for every occasion – Terminus Carol, Suzie Homemaker Carol and now, Carol in Wolf’s clothing. Great for Halloween. Trick or treat. The rioters outside the barbershop are a mix of the living and the walking dead. Daniel is afraid that they’ll try to break into his shop but Travis thinks their group will be fine, until the fire from the shop next door starts to blister through the wall. The group realized that their only option is to go outside, to try to make it to Travis’ pickup truck. As they go out, some of the crowd spills in, smashing everything they can. Once outside, the group makes their way through the mayhem, watching one cop bite another. They find some measure of cover by walking under some scaffolding, until the riot police turn fire hoses on the crowd, knocking the scaffolding down and injuring Griselda. Travis picks her up and they finally locate Travis truck. Oddly enough, by driving only a couple of blocks, they’re away from any crowds. They want to get Griselda to a hospital, as her leg has been crushed, but the first hospital they arrive at is under siege by the police. Officers are gunning down patients who have obviously already turned. As they watch the city of Los Angeles go dark due to power outages, they realize they have to go home if they’re going to find any safety. Travis offers to drop Daniel and his family off somewhere, but Daniel insists that they’re going with the rest of the group. Maddy, Alicia and Nick, having already witnessed one neighbor snack on another, decide that they should play a game of Monopoly. Monopoly? In the middle of the worst thing they’ve ever witnessed, they want to play a board game? Well, they do, after Nick gets his Oxy fix. He probably didn’t even care if he passed “GO” or collected $200. The game also helps as a perfect distraction from the sounds of gunfire and whatever is scraping the outside of the house. Nick is feeding his mother’s other fears, though, by making comments about how Travis might not be coming back for them because he’s with his family. The game ends abruptly when the power goes out and they hear the scratching sound again. Nick goes to the back door to find out what it is and sees a German Shepherd clawing at the sliding door. The dog has blood on him but it’s not his blood. They then spot Pete, their neighbor, making his way towards the house. Nick tells his mother that the other neighbors, the Trans, have a shotgun he knows about because he considered stealing it at one time. He, Maddy and Alicia head to the Tran’s house to find it. Once it’s been located, they go to turn back, but Pete has gone into their house and is sating himself on the dog. Travis pulls into the driveway and Maddy and Nick run out to warn him, but Travis has already gone inside. He sees Pete and the dog and approaches Pete to talk to him. Perhaps he’s forgotten about Calvin already. Pete moves towards Travis and Maddy aims the shogun at Pete, but Travis stops her from shooting him. Daniel then wrests the gun from Maddy and shoots Pete in the face. That only stuns Pete, so Daniel takes a second shot and he goes down. Alicia is outside and has stumbled across Susan Tran, who is behind a fence and is no longer Susan Tran. Susan grabs Alicia, and Chris is able to save her before she becomes dinner. Thrashing about, she hits Chris right in the nose. Alicia refuses to believe that Matt could have suffered the same fate, and insists that he’s sick, just like Susan. But Nick says that they’re not sick, they’re dead. Nick is in a bad way, so we’ll give him a pass, for now, for being a little short on empathy. Daniel tells Travis that he’s reached his cousin and they’ll be leaving in the morning. Maddy wants to leave right away but Travis says they’re staying until the morning, as well. He then rolls Pete up in a blanket and drags him outside. Liza and Travis are in the kitchen and she, from a nurse’s perspective, paints a rather bleak picture of what will happen to Griselda if her foot isn’t treated. Ofelia wants to stay with Travis and his family, but Daniel doesn’t want to become indebted to anyone. Griselda tells her daughter to trust her father. Liza and Maddy talk in the kitchen and Liza wants the two of them to support each other as mothers who should be looking out for their children. Maddy tells her how Susan took care of her kids and asks Liza to take of ending it for her should it come to that because Travis would be broken if he had to do it. Travis, Maddy and the rest are ready to go and get into their vehicles. Nick wants more pills and Maddy hands him a couple of them. He sees that his supple is low and asks her what happened to the rest. She tells him that she gave them to Griselda and that she’ll take care of him. He says that he doesn’t need her, he needs his medicine. He doesn’t get a pass for that one and one can only hope that the next walker they come across turns him into teenager tartare. Ofelia is still trying to convince her Dad to go with Travis’ family but he’s not budging. She says that they’re good people but Daniel tells her that good people are the first ones to die. Travis and company pull away and make their way down the street. Military helicopters are flying over the area. As Maddy is about to round the corner, she spots Patrick getting out of his car in front of his house. She makes a u-turn to stop him before he sees his wife. By the time she and the others pull up, though, Patrick is reaching for Susan to hug her. Before they embrace, a shot rings out and Susan fall to the ground. Soldiers are surrounding them. Soldiers are everywhere. They’re conducting interviews and asking about who is staying at Maddy’s. When Maddy is asked about the grave, she tells them their dog died. Travis tells Maddy that things are going to get better now. Daniel tells his family that it’s already too late. He’s right, of course. It’s probably safe to upgrade Rick Grimes’ condition to stable and mobile. It’s likely that he’s encountered Morgan, by now, and they’re not playing Monopoly. Hershel, Maggie and Beth might be, but, then again, Hershel kept his wife in the barn.